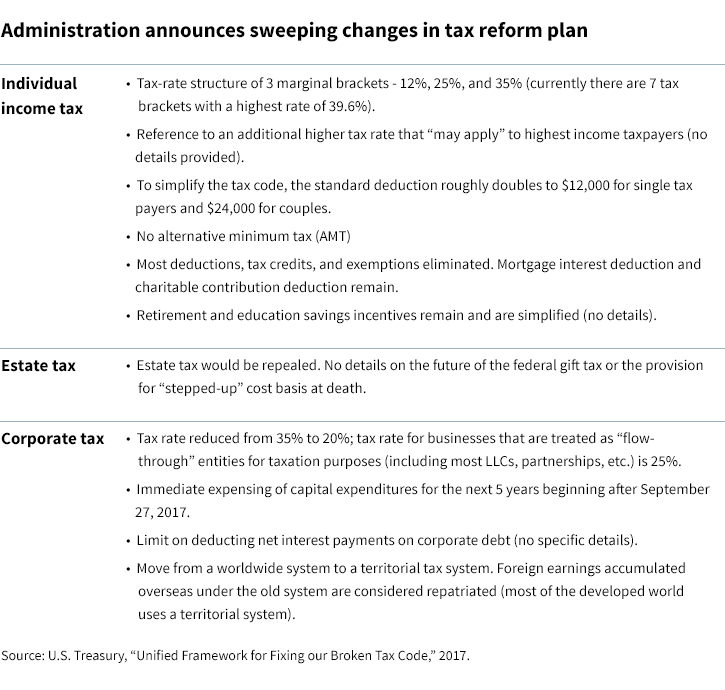 Reductions in individual and corporate tax rates, higher standard deductions, and the elimination of the estate tax and alternative minimum tax were among the highlights of the Trump administration’s tax proposal released this week. The proposal, “Unified Framework for Fixing our Broken Tax Code,” announced by the administration, the House Ways and Means Committee, and the Senate Finance Committee, aims to simplify the tax code and reduce tax rates for individuals and businesses. Few details were released on some of the initiatives, and the announcement did not include a discussion of how the cuts would be balanced by revenue. Here are some of the highlights of the proposal. The proposal serves as an outline for congressional committees to begin working on legislation. The framework does not guarantee that all of its components will make it into the final bill, or that a tax reform bill will pass at all. With significant changes to the tax code and sweeping tax rate reductions, there is certain to be extensive debate. For example, support for repealing the estate tax has been uneven in other discussions as it only applies to individuals with more than $5.5 million in net worth and couples with more than $11 million. While the proposal retains mortgage and charitable deductions, it is unclear whether limitations may be introduced as has been done in past debates. Compromise will be needed to finalize the tax rate reductions as well, as various stakeholders in the debate have different views on how much the rates should be reduced. Advisors and investors will want to monitor the progress of tax reform and any changes that may have an impact on financial and tax planning.